I’m not really satisfied with panel 2, but for the life of me, I just could not figure out a way to visually show Sky and Bennesaud struggling against the ropes. I think the little white action-y lines are a bit cheesy and don’t fit the look of the series very well, so I don’t use them too often. But it was really all I had to work with to convey some sort of movement. Regarding Ril’s buckle knives, as I mentioned in previous posts, I like for all the information to be there for readers if they know to look for it. So in this case, I deliberately drew him with his buckle showing back in the first page of this issue, The Big Snow Job #4, Page 1. It’s really tiny and easy to miss, which I guess is the point. But I wanted it to be there. And it’s also why I wanted to call attention to it in the Free Kespa Colony Station disarming scene, way back in The Big Snow Job #1, Page 17. 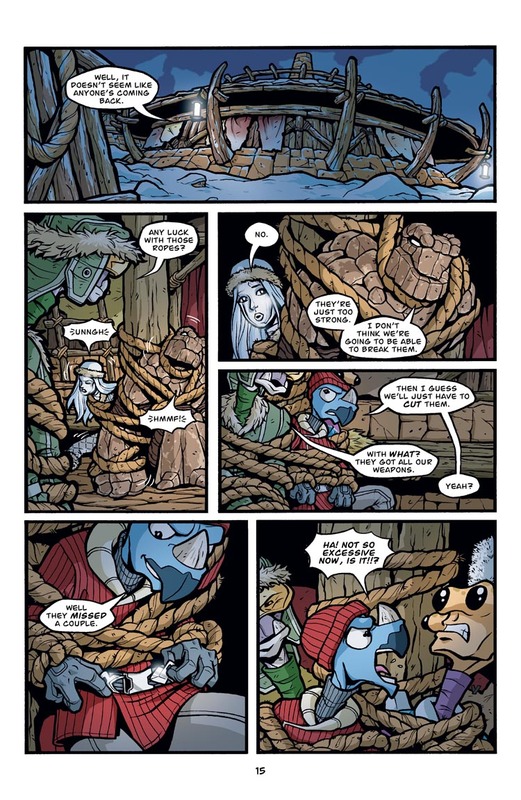 I’m not sure it would work here, but I believe I’ve seen rope/tie struggle in a small series of panels showing the guy/girl hands/whatever pulling futilely – relaxed tangle, pulled tangle, relaxed again. No/not much movement. As for the hidden blade thingy, it is hilarious if not completely… eh, out of character. But it is offset by Ril’s prominent horn and healthy set of teeth, any of which could have been purposed for the task together with his likewise prominent temper. (And I expect Ril is honing his horn on off time, him being Ril.) Of course, having a blade it’s the better option. Speaking of teeth, something just occurred to me. Do Sky’s teeth turn to high-strength metallic as well? The girl might have had a mouth full of cutlery herself – though gnawing through ropes is hardly lady-like. Since Runners is not a silent comic book I think the panel would have worked without the white action lines, because of the text, facial expressions and restricted movement. Say Torbjörn, how come you think the buckle knives are out of character? I thought Ril was being established as a walking arsenal, so handy hidden weapons wouldn’t be strange for him to have. Ah, I get your point now. Indeed, the joke would have worked also if Ril had yet another hidden ‘weapon’, like his horn, teeth or perhaps another set of blades hidden elswhere… And it would show even more how resourceful Ril is. Still, I’m a big fan of continuity. So I prefer the return of the buckle belt blades. 1. Thanks for the avatar. 3. Definitely NOT out of character for Ril. I would have been surprised had he not have had something hidden up his sleeve! 4. Oh yes that last panel makes the strip come alive! Glad everyone liked the last panel. It was a fun one to draw. Anytime someone is yelling so much that spit is flying from his mouth, it makes for a fun panel. @ArtieTech: you’re welcome for the avatar! Glad to see some people using them. And the thought of Ril sharpening his horn is pretty funny to me. It’s almost something he would actually do. Heh, yes I LOL’d at the last panel myself. Love it. This has been a great story so far, Sean. I got an honest chuckle out of the last panel, but — and I’m sure you wouldn’t be keen on the comparison — I immediately thought of Jayne Cobb’s line, “Boy, it sure would be nice if we had some grenades, don’t you think?” But that could be because I was just reading some Serenity stuff last night. Your mention of Serenity made me wonder if you have heard of the podcast series based on the Firefly series? You can find it at : http://www.misfitsaudio.com/serialmiranda.php . I seriously was bummed when it disappeared from network TV without warning. As for the grenade remark, I once won a $50 bet by having something in my van that no one believed I would have. Regarding FIREFLY, yeah, I was really bummed when it was canceled, but also a tiny bit relieved. I was already working on “RUNNERS: Bad Goods” when it came out, and it just freaked me out that another series would be mining the same territory of smugglers in space who start off by finding a girl in a container. Ack. But yeah, it was an awesome show. Interesting timing in your comments…just a couple days ago, I finally finished reading the 2 official FIREFLY Companion books, which have the actual screenplays for every episode. Not too many shows I can think of where just reading the scripts would be hugely entertaining. The action lines were subtle enough that I had to go back to notice them.